The MyT10 BlackPocket Folding Ping Pong Table is a fusion of style, quality and attention-to-detail. The black-on-black color scheme adds jaw-dropping style to any room while creating opportunities for healthy human interaction. Killerspin proudly exists to connect families, friends, customers and employees through table tennis. This revolutionary table is designed to look great and perform even better. The playing surface features a repeat roller coating in matte black with gloss black lines to offset the look. Setup and storage is easy, and innovative storage pockets hidden in the table frame at each end allows for easy access to balls and paddles. Our MyT10 BlackPocket table is designed and built to tournament grade standards. The table top is constructed of high quality 1” MDF for unparalleled ball bounce and intense, competitive play. This is simply the best folding ping pong table on the market. Stop chasing balls around the room. Store up to 8 ping pong balls and 1 paddle in each end of the MyT10 BlackPocket ping pong table. These revolutionary Killerspin storage pockets are built right into the table frame. Pockets for ping pong balls and rackets are located in each end of the table to allow easy access to your table tennis equipment. Storage has never been easier. Placed order and table was delivered within the week. It looks awesome, plays great and is easy to move since we have it in the basement and needed it to be mobile. Love it!! Two years on, still as fantastic as day one! I have waited nearly two years to write this review. We originally bought our MyT10 Black Pocket in early 2017. It being our first Killerspin purchase we wanted to ensure durability given that we expected a heavy workload from a mass of young people (and adults). I am happy to report that this table is extremely durable. Of course it has some nicks and such but, that is going to happen with any table receiving this level of usage. The overall surface is still excellent (and easy to clean) and we have had no issues with any movable components on the table. We also love the "pocket" feature for keeping track of the paddles and balls. I highly recommend you consider a table with this feature if you have younger members of the family. We used the white glove service and they had the table delivered and fully installed in less than 30 mins. Beautiful Table, WELL BUILT FOR SURE, very smooth wheels, easy to unlock and lock. Only downside was the center lines not matching up. I bought this table for our game room before Christmas. 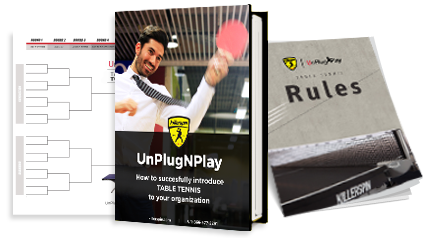 We wanted a high quality table that would last for a long time with the flexibility for single play, After researching ping pong tables, Killerspin tables came out on top. They are highly rated and I can see why. We were not disappointed, this table exceeded our expectations. This table plays well, has a nice modern look, and is very durable. My teenage son and husband have been playing on it almost daily since the holiday. It has created some additional bonding time between the two. It really is a NICE table. The process to get this table out to the Boston, MA area was seamless. Lazar Milovic was the Concerige Service person that handled my order from beginning to end. He made it happen. He was able to get us this table two weeks before Christmas. Lazar was extremely helpful in addressing my initial questions about the table, ordered the table for me, and managed the delivery/setup process for us. We paid for the White Glove Service which I'm glad we did. Lazar was instrumental in arranging for local delivery and then co-ordinating with a separate team to come out, (from the NY area) and setup the table for us. These guys were efficient, quick, and extremely professional. Thanks Killerspin for making an awesome ping pong table, and Lazar for all your help and patience.